Tough tenors Arnett Cobb and Eddie “Lockjaw” Davis team up for a thoroughly swinging session. Blow Arnett, Blow confirmed Cobb’s return to the scene after the tenor saxophonist’s long recovery of his car accident in 1956. Everybody who was present at Arnett Cobb’s performance at club Porgy & Bess in my hometown of Terneuzen, The Netherlands in 1986 is still talking about it. I’m told that many are walking around with goosebumps even now. It was an emotional evening. It was well-known that Cobb, on crutches, had been enduring severe pains throughout his life. Nonetheless, the good-natured Cobb blew the roof of the building. The club badly needed a renovation anyway. Surely this was typical for clubs and audiences around the world. Cobb is always smiling broadly on album covers. And he was always ready to blow. Highly unlikely that the big-toned tenor saxophonist needed encouragement. 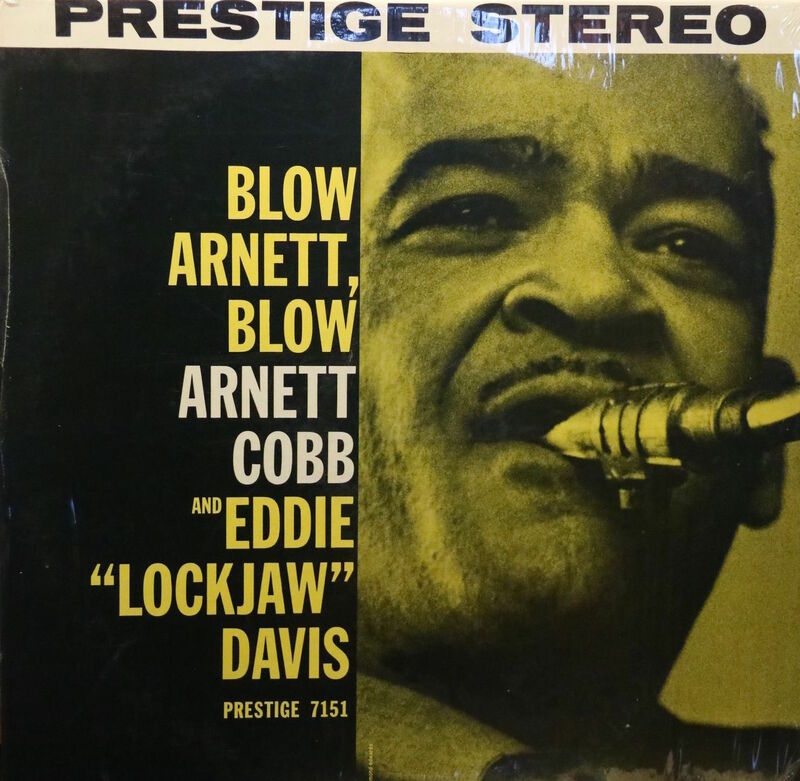 So the title of the album may be superfluous, but it definitely was a bright idea from Prestige producer Esmond Edwards to couple Cobb with fellow tough tenorist Eddie “Lockjaw” Davis. Bright and anybody’s guess, since Cobb hadn’t played for a few years, but it turned out to be a sparkling affair. Arnett Cobb, from Houston, Texas, first gained recognition in Milt Larkin’s orchestra. Also in the reed chair were fellow Texans Illinois Jacquet and Eddie “Cleanhead” Vinson. Following up Illinois Jacquet in Lionel Hampton’s orchestra, with Jacquet having provided a spectacular, successful and iconic solo in Flying Home, was quite a challenge but Cobb was a mainstay and the succes of the years between 1942 and 1947 of the Hampton band was unprecedented. Cobb’s career as a leader after leaving Hampton was unfortunately hampered by spinal pains and surgery in 1950. Cobb did write the music and lyrics of Smooth Sailin’ in 1951, which became a big hit for Ella Fitzgerald and which would be the title and title song of the follow-up album to Blow Arnett Blow. Despite the setback, Cobb’s group became very popular, particularly in the Mid-Western ‘chitlin’ circuit’ of clubs in the black community. Like other saxophonists who had come up through the swing bands, Cobb had formed a seven-piece band with a four-piece rhythm section including guitar, modeled after the groups of r&b pioneer Louis Jordan, Bull Moose Jackson and Wynonie Harris. In 1956, Cobb was involved in a car accident. His legs were crushed. He was in and out of the hospital for nearly three years and needed crutches for the rest of his life. Regardless of his shortcomings, Cobb toured extensively in Europe in the seventies and eighties, to much acclaim. Cobb passed away in 1989. Ever heard a bigger sound than that of Arnett Cobb? It’s huge. His stomping, meaty style lifts up from the ground When I Grow To Old To Dream and mid-tempo blues riffs like Go Red Go and The Fluke. The uptempo showstopper Go Power is the standout track. Cobb puts your back against the wall, barking, swinging, wailing with short, rotund notes. He’s a tireless boxer hitting the sack. His old buddy from the Milt Larkin band, influential organist Wild Bill Davis, chimes in with his typical orchestral voicings and lines, seemingly unaffected by the modern organ revolution of Jimmy Smith. The unique phrasing, the continuity of surprising ideas and wit of Eddie “Lockjaw” Davis never fails to arouse spirits. More than a battle, the two commanding tenor saxophonists are involved in a playful wrestle match. During the years of 1959/60, Cobb recorded seven albums for Prestige, some of which contained interesting pairings with pianists Bobby Timmons and Red Garland. It was the most fruitful period of Cobb’s career.